Residual malaria transmission can persist despite high coverage with effective long-lasting insecticidal nets (LLINs) and/or indoor residual spraying (IRS), because many vector mosquitoes evade them by feeding on animals, feeding outdoors, resting outdoors or rapidly exiting from houses after entering them. However, many of these behaviours that render vectors resilient to control with IRS and LLINs also make them vulnerable to some emerging new alternative interventions. Furthermore, vector control measures targeting preferred behaviours of mosquitoes often force them to express previously rare alternative behaviours, which can then be targeted with these complementary new interventions. For example, deployment of LLINs against vectors that historically fed predominantly indoors on humans typically results in persisting transmission by residual populations that survive by feeding outdoors on humans and animals, where they may then be targeted with vapour-phase insecticides and veterinary insecticides, respectively. So while the ability of mosquitoes to express alternative behaviours limits the impact of LLINs and IRS, it also creates measurable and unprecedented opportunities for deploying complementary additional approaches that would otherwise be ineffective. Now that more diverse vector control methods are finally becoming available, well-established entomological field techniques for surveying adult mosquito behaviours should be fully exploited by national malaria control programmes, to rationally and adaptively map out new opportunities for their effective deployment. Specific mosquito behaviours, such as outdoor resting, outdoor feeding, feeding on animals and early exiting from houses, allow malaria vectors to avoid exposure to insecticides delivered to houses in the forms of long-lasting insecticidal nets (LLINs) and/or indoor residual sprays (IRS). Mosquitoes which exhibit one or more of these behaviours are responsible for persistent residual malaria transmission, even where high coverage of LLINs and/or IRS has been achieved. While these behaviours make mosquito populations robust to control with LLINs and IRS, they also make them vulnerable to emerging new vector control technologies that target them while feeding outdoors on humans or cattle. Scaling up interventions that selectively target any specific blood feeding behaviour increases the proportional contributions of alternative behaviours to mosquito survival, so that these can then be targeted with complementary additional interventions. For example, following a scale-up of LLINs to target indoor-feeding mosquitoes, surviving mosquitoes obtain most of their blood meals outdoors from humans and livestock, where they may be targeted with insecticidal clothing or vapour emanators and veterinary insecticides, respectively. National malaria control programmes should now take full advantage of long-established, practical and affordable entomological field survey methods, to identify, create and exploit opportunities for effectively targeting adult mosquitoes with a greater diversity of control measures. The creative, adaptive, problem-solving traditions of the discipline once known as epidemiological entomology need to be urgently revived and rejuvenated at all levels of policy and practice. However, a number of rejuvenated, repurposed and entirely new vector control methods are now emerging that can address residual malaria transmission by complementing, and even superseding, current LLIN and IRS technologies.8 It is therefore time to be more optimistic, and urgently rethink how we look at malaria vector behaviours. Specifically, we need to start viewing phenomena like outdoor feeding, feeding on animals and early exit from houses as missed opportunities for rational deployment of new interventions, rather than merely obstacles to success with existing IRS and LLIN options. Furthermore, previously unusual behaviours of adult mosquitoes often become vital to their continued survival following deployment of interventions targeting more common behaviours, creating measurable new opportunities for complementary additional approaches to target these engineered vulnerabilities. 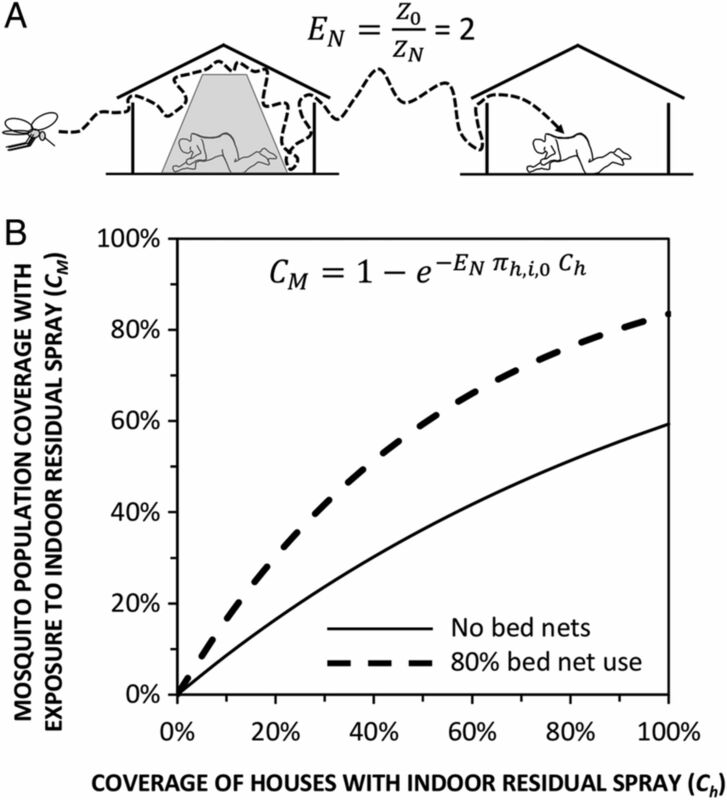 An illustration of how high coverage with bed nets can enhance the impact of a second domestic vector control measure with insecticides, such as IRS, by forcing mosquitoes to visit far more houses than they normally would. (A) A schematic representation of how reducing the availability of human blood (Z) with 80% human usage (Uh=0.8) of bed nets (N) can double the number of encounters (E) with humans required by Anopheles arabiensis to obtain a blood meal, relative to baseline conditions with no nets (0).10 (B) Estimated coverage of the mosquito population (CM) with exposure to insecticide28 delivered through IRS, at varying levels of house coverage (Ch). Mosquito population coverage is expressed as the proportion of mosquitoes exposed to insecticide per feeding cycle and calculated by expressing equation 8 of a previously published model28 using the same notation as the model of A. arabiensis early-exit behaviour,10 assuming that 90% of all attacks on humans would occur indoors in the absence of any protection measure (πh,i,0=0.9). IRS, indoor residual spraying. As illustrated mechanistically in figure 2, such layering of interventions in a logical sequence can enable rational manipulation and exploitation of mosquito behaviour patterns, sometimes referred to as ‘push–pull’ strategies35–38 that originate from the agriculture sector.39 Such altered postintervention behavioural patterns create new opportunities for targeting outdoor-feeding vectors with insecticide clothing treatments,18 ,19 insecticide vapour emanators22–24 and/or veterinary insecticides28 that would previously have been ineffective. These intervention options can therefore be expected to have a much greater impact on residual transmission as second-line and third-line measures to supplement LLINs in an elimination programme than they ever could on baseline transmission as the first-line measure in a control programme. Interestingly, a similar rationale may even be applicable to enhance the impact of attractive toxic sugar baits,40 because mosquitoes with less access to blood often maintain their increased energetic requirements by consuming more sugar. A schematic illustration of how sequential layers of vector control interventions against particular fractions of blood-feeding mosquitoes can create measurable opportunities for complementary approaches to achieve increasingly dramatic impacts on vector survival and residual transmission. This illustration is based on the well-characterised example of Anopheles arabiensis in southern Tanzania,10 as described in the section entitled Manipulating vector behaviours to create new intervention opportunities. We provide a simple online interactive graphical model (https://andysouth.shinyapps.io/coverage1/) allowing the reader to investigate the implications of combining interventions targeting different behaviour patterns under different baseline scenarios of proportional feeding indoor and on humans. The source code (in the statistical language R) is also provided so that the reader can run offline (https://github.com/AndySouth/coverage). LLIN, long-lasting insecticidal net. However, many vector species exhibit considerable plasticity in these traits, so that each can adapt instantaneously and opportunistically to local, fine-scale heterogeneities in the availability of environmental resources. Many mosquito species have been observed to exhibit both extremes of human feeding versus animal feeding, indoor-feeding versus outdoor-feeding and indoor-resting versus outdoor-resting behaviours (figure 3). The ideal, but probably unachievable, optimal balance of vector control interventions can therefore vary greatly between neighbouring villages, or even within a single village. Of course, human beings are essential to malaria transmission, and also exhibit important plastic behavioural variations between individuals, families and communities that are driven by necessity, opportunities, culture and idiosyncrasy. Heterogeneities of mosquito and human behaviours (figure 3) create foci of low biological coverage of the blood and resting site resources targeted by each distinct vector control measure, bolstering malaria transmission against elimination with any single one of these intervention options. There is therefore no single theoretically ideal first-choice intervention: a combination will be required to deal with all extremes of this variation observed on fine geographic and demographic scales. Examples of extremely heterogeneous behavioural outcomes, which arise from behavioural plasticity of malaria vector mosquitoes and their human victims, and occur across the full range of spatial scales that are relevant to vector control intervention selection. (A) Specimens of blood-fed, indoor-resting Anopheles arabiensis sampled from 12 different locations within a single village in northern Tanzania yielded estimates for the proportion of blood meals obtained from humans,68 which are distributed across the full possible range of values. (B) The estimated fraction of A. arabiensis which rest indoors after feeding (reported originally as the estimated usage rate for indoor resting sites per feeding cycle52) varies across a range of more than 300-fold in 21 distinct villages surveyed all across Africa. (C) Variations of only 1–3 hours in the times at which people go indoors for the evening and leave the house in the morning, among 9458 occupants of houses with well-screened windows and ventilation points in a single African city,69 result in derived estimates for the proportion of remaining residual transmission exposure that occurs outdoors (assuming that a 90% protective effect of the screening is accounted for as previously described9) which are widely distributed across most of the full range of possible values. Fortunately, the extremes of variation in each behavioural phenotype that occur within the purview of any given control programme, which bolster transmission against any one of these interventions, also render it more vulnerable to the others. For example, while frequent feeding on animals in a subset of housing compounds within a single village (figure 3A) may attenuate the impact of insecticidal protection of humans using LLINs, IRS, insecticide-treated clothes or vapour-phase insecticide emanators, it also enables impact by insecticidal livestock (table 1), and the reverse may be true in a neighbouring compound where the same vector feeds mostly on humans (figure 3A). Similarly, while higher proportions of outdoor resting in different villages (figure 3B) can attenuate the local impact of IRS,70 and individual human tendencies to spend more time outdoors within a single city (figure 3C) can undermine the protective effects of mosquito-proofed housing,69 both phenomena should increase the impact of outdoor vapour-phase insecticides (table 1). Of course, it is not realistic to monitor such behavioural metrics everywhere at all times across entire countries, so control programmes merely need sufficiently representative surveys to determine the range and distribution of values that intervention packages will need to address. The mean values obtained through such nationally representative or hot spot-targeted surveys may be used to prioritise front-line options in control programmes, while the extremes are indicative of what additional interventions may be required to eliminate malaria countrywide. However, in order for control programme managers and product developers to confidently rely on such ‘cheap and cheerful' entomological indicators, they must first be rigorously evaluated across diverse settings in terms of their epidemiological predictive power. While the theoretical evidence base emphasising the importance of such behavioural measurements has become stronger in recent years,3 ,8 ,52 ,54 ,55 ,71–74 direct empirical field assessments of their predictive value and generalisability are now urgently needed. To the best of our knowledge, no wide-scale, multisite assessment of the epidemiological relevance of any behavioural indicator other than the human blood index3 ,45 ,46 ,75 has ever been conducted, but some examples from single-site studies give an encouraging idea of how this might be achieved and what kind of predictive values they may yield (figure 4). Examples of how field-surveyed metrics of adult mosquito behaviours can be predictive of vector control impact. The first two panels illustrate how preintervention measurements for indicators of outdoor resting (A) and early morning biting (B) were predictive of the impact of indoor residual spraying with Propoxur on Anopheles gambiae sensu lato during the Garki Project in northern Nigeria in the early 1970s,70 while the last panel illustrates how known preferences of mosquito species for feeding on humans are predictive of the impact of window screening in contemporary Dar es Salaam, coastal Tanzania (Chaki et al, Unpublished). The WHO has recently provided laudable leadership and direction by finally embracing a much more inclusive, devolved, diversified and adventurous, but nevertheless rational, approach to malaria vector control.6 This historic recent policy revision now encourages locally tailored, programmatic development of a much wider variety of malaria vector control interventions on a biologically rational basis.6 Those of us responsible for surveillance of malaria vector mosquito populations must now respond to this unprecedented formal broadening of our mandate. Sustainable entomological surveillance platforms are urgently needed that go beyond merely reporting physiological resistance to insecticides as the sole explanatory predictor of vector control impact. National and regional surveillance teams should now creatively and adaptively apply long neglected entomological techniques, to routinely measure targetable vector behaviours as a means to inform intervention choice and maximise impact. The authors thank Allison Tatarsky and Roland Gosling for stimulating discussions that motivated this study and for their comments on an earlier draft of the manuscript. WHO-UNICEF. Achieving the malaria MDG target: reversing the incidence of malaria 2000–2015. Geneva, Switzerland: World Health Organization and the United Nations Children's Fund, 2015:40p.
. Residual transmission of malaria: an old issue for new approaches. In: Manguin S, ed. Anopheles mosquitoes—new insights into malaria vectors. Rijeka: Intech, 2013:671–704. WHO. Guidance note-control of residual malaria parasite transmission. World Health Organization Global Malaria Programme, 2014:5p. WHO. Global technical strategy for malaria for 2016–2030. Geneva: World Health Organization, Global Malaria Programme, 2015:32p.
. The influence of vector behavior upon malaria transmission. Am J Trop Med Hyg 1972;21:755–63.
. A new tool for malaria prevention? Results of a trial of permethrin-impregnated bedsheets (shukas) in an area of unstable transmission. Int J Epidemiol 2003;32:157–60.
. A low technology emanator treated with the volatile pyrethroid transfluthrin confers long term protection against outdoor biting vectors of lymphatic filariasis, arboviruses and malaria. PLoS Negl Trop Dis 2017;11:e0005455.
. Efficacy and user acceptability of transfluthrin-treated sisal and hessian decorations for protecting against mosquito bites in outdoor bars. Parasit Vectors 2017;10:197.
. 15 October 2015 2015. United States of America patent US 2015/0289513 A1.
. Rationalizing historical successes of malaria control in Africa in terms of mosquito resource availability management. Am J Trop Med Hyg 2004;71(Suppl 2):87–93.
. The human blood index of malarial vectors in relationship to epidemiological assessment. Bull World Health Organ 1964;30:241–61.
. Mosquito behaviour in relation to malaria transmission and control in the tropics. London: Edward Arnold & Co, 1951:219p.
. The significance of irritability, behaviouristic avoidance and allied phenomena in malaria eradication. Bull World Health Organ 1960;22:721–34.
. Blood feeding and its epidemiological significance. Mosquito ecology: field sampling methods. Dordrecht, The Netherlands: Springer, 2008:677–769.
. A method for estimating the man-biting rate. Geneva: World Health Organization, 1964:22.
. Studies on man-vector contact in some malarious areas in Colombia. Bull World Health Organ 1968;38:239–53.
. Impact of propoxur on Anopheles gambiae s.l. and some other anopheline populations, and its relationship with some pre-spraying variables. Bull World Health Organ 1976;54:379–89.
. A global index representing the stability of malaria transmission. Am J Trop Med Hyg 2004;70:486–98.
. Malaria vectorial capacity of a population of Anopheles gambiae: an exercise in epidemiological entomology. Bull World Health Organ 1969;40:531–45.
. Malaria control: achievements, problems and strategies. Parassitologia 2001;43:1–89. Contributors GFK conceived and acts as the guarantor for the study. He drafted the manuscript in consultation with the other authors. GFK, JMM, SSK, ABS, LST, PPC and NJG all contributed substantively to the literature identified and interpreted, and to the logic and presentation of the content. ABS developed the interactive graphical model in consultation with GFK. All authors critically reviewed and approved the manuscript. Funding Financial support for this study was kindly provided by the European Union through the Seventh Framework Programme (FP7/2007-2013 grant agreement 265 660), the Parker Foundation through a gift to the Global Health Group Malaria Elimination Initiative at the University of California at San Francisco, Wellcome Trust Research Training Fellowships awarded to SSK (grant number 107599/Z/15/Z) and NJG (grant number 102368/Z/13/Z) and a Skills Development Fellowship awarded to LST (grant number N011570) jointly funded by the UK Medical Research Council and the UK Department for International Development.